N.B. If you are using sat-nav, please do NOT come up Churchill Road - no through access! From Cirencester follow A419 signposted to Stroud. After approx 7 – 8 miles, there is a steep downhill into the valley. Ignore first signpost to Brownshill, a sharp turn besides a church. 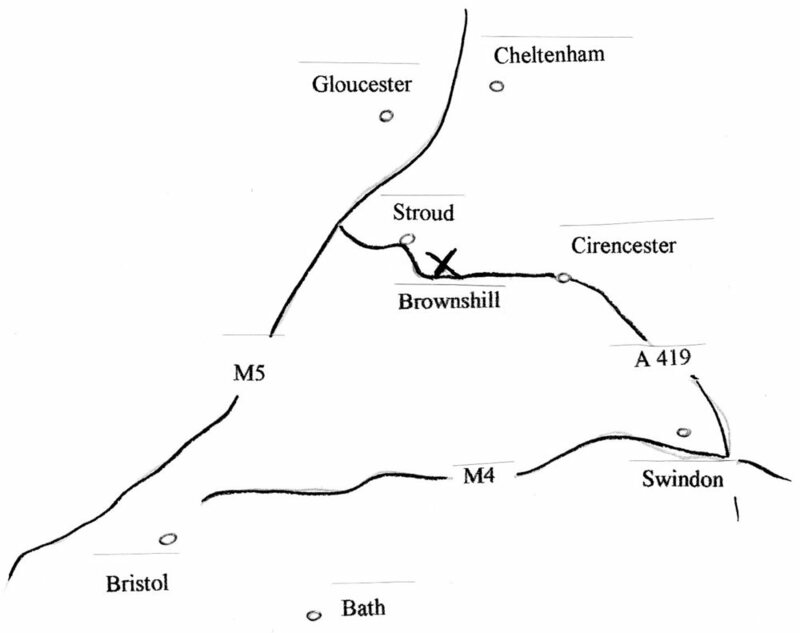 Continue along A419, enter Brimscombe. Turn right into Toadsmoor Road - signposted to Bussage, Bisley, Eastcombe, Brownshill. Continue along Toadsmoor valley, through traffic lights where road narrows. Road steeps uphill then take right turning signposted to Bussage and Brownshill. Drive through housing estate until you come to a Recreation ground on your left. At the crossroads at the end of Recreation Ground turn right, alongside allotments on your left. Continue down this lane through the 'No Through Road notices' and 'Access only' (passing Polly's Nursery on your left), keep going gently downhill. There is a sign ‘Access to Monastery’ from which the monastery can be seen in front of you. Take A 419 direction Stroud and Cirencester. Continue to follow signs for A 419 Cirencester as you drive through Stroud. Drive out of Stroud, through Trupp and enter Brimscombe. There will be a sign for Brimscombe Mill and Port to the right, then a parade of shops on the left with a service road. Take next (big) turning on left - Toadsmoor Road - signposted to Bussage, Bisley, Eastcombe and others. Continue on road through traffic lights where road narrows. Continue down this lane through the 'No Through Road notices' and 'Access only' (passing Polly's Nursery on your left), keep going and we are on right.